This archive document primarily applies to older V2 and V1 MicroSquirt® controllers. 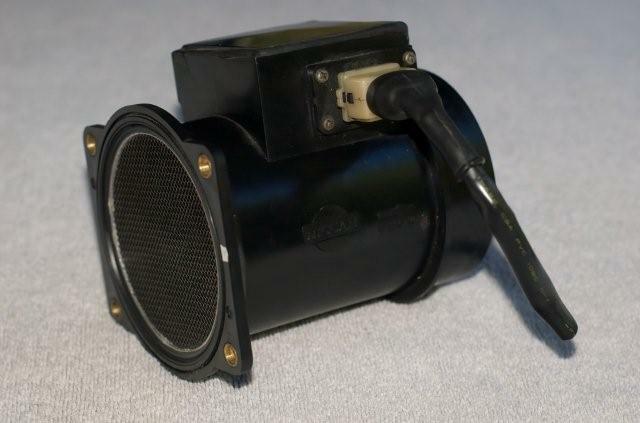 A major addition to the MicroSquirt® code is MAF (mass air flow) sensor capability and also a combined MAF/ MAP mode. Rather than calculating the air flow from the VE table and manifold pressure (MAP), the mass air flow sensor measure the amount of air directly. In some cases this can make the engine easier to tune, and better at adapting to changing engine parameters. On the other hand, the MAF sensor itself can present an significant airflow restriction to the engine (limiting power), and sometimes can have range limitations if the engine flow a lot more (or less) than the application it was designed for. This change and all others following apply to both MicroSquirt® and MegaSquirt-II™. When the MAF option is selected with a v1 MicroSquirt® EFI controller, the sensor would normally be wired to the MAP pin. If, however, the combined MAF/ MAP option is selected, then MAF MUST be connected to the Barometric/second EGO sensor pin (#29) (you cannot use the knock pin with a v1 MicroSquirt® EFI controller, it is not brought out to the AMPseal connector on MicroSquirt®). However the v2 MicroSquirt® EFI controller board has AD7 on pin 5 of the Ampseal so you can use it for MAF. Plus, if you have Frequency output MAF, you MUST use this pin because it is simultaneously tied to processor pin T7 which is the only timer pin that has a special read Frequency period mode, so it automates this process, making it much more accurate. (A/F)s is the air-to-fuel ratio at stoichiometric for the fuel being used. The mass air per cylinder is determined by numerically integrating the mass air flow rate provided by the sensor. Where STP = Standard Temperature and Pressure = 25 °C, 29.92 in Hg (101.3 kPa) BARO, WOT = wide open throttle. Peak value of LOAD_ABS correlates with volumetric efficiency at WOT. There is more information on tuning the MAF curve below. 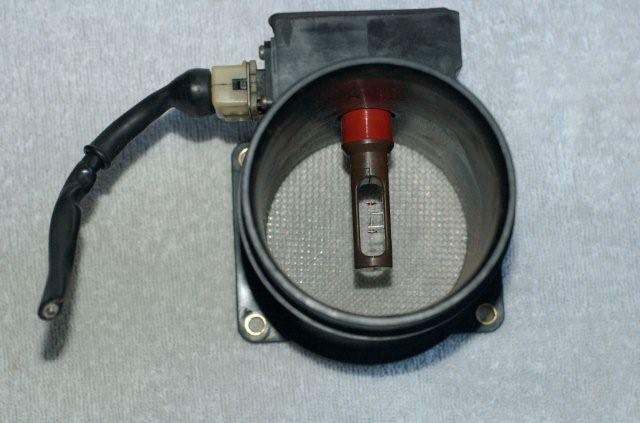 An alternative to the Ford MAF sensor is the Infiniti (Nissan) Q45 MAF sensor, which apparently flows more air than any other stock MAF sensor. It has an clear inside diameter of 3.19 inches (80mm). These are cheap on eBay. Like the Ford MAF sensor, it is voltage-out (not frequency), so it is relatively easy to hook-up to MegaSquirt-II™. 12V - Black/White, pin "E"
There is a full output curve for this (and other) Nissan MAF sensors in this spreadsheet. The MAF ducting is important to its air flow/output voltage curve, yet very few aftermarket manufacturers know this. If you change any of the ducting, remove/add an air cleaner, or even put your hand in front of the airstream you will see a calibration change. You can see this just by running the engine at idle and remove the air cleaner or stick your hand in front of the airstream while watching the O2 readings. Idle (i.e. low mass air flow rates) region is most sensitive. In the end the curve measured on the bench is the most accurate but it still needs tweaking when installed in the vehicle. To tune, you need to know that a certain voltage output from the MAF means a specific grams of air per sec going through the MAF. You can get that from documentation or OEM curve provided the sensor location and ducting is exactly as it was stock from the factory or by having the MAF + ducting flowed or by using an accurate O2 sensor. So if you have a non-OEM setup you need to tweak the transfer function on the car. In the case of having a non-OEM set-up, you start with some curve that will at least allow the car to run, then tuning the calibration curve to make the O2 reading match the target O2 reading. Do this for a few rpms and you can fit it all to King's equation which captures the shape of the MAF curve with only 2 or 3 parameters. This is relatively easy with a narrow band exhaust gas oxygen sensor (or a wideband EGO sensor, just try to tune near the stoich point to minimize errors). You can get a good feel for the accuracy of a MAF curve by using a cheap NB sensor. The NB is accurate because it limits itself to one point, and all you really need, for most purposes, is that 1 AFR point at a few different flows (rpms). Note: on a V3 main board, you can use one of the SPR jumpers to bring the MAF signal in through the DB37 connector. With the relay board, it gets more 'custom'. DB37 pin 31 - S4 on the relay board 20-position terminal block. See the IAC page for more details on which connects where. If you are using a stepper IAC, but not using the FIdle for anything else, then you can jumper the relay (like for the PWM idle valve in this link) and used the FIdle position on the terminal block. Of course, you could also bypass the relay board completely, and run the wire right to the DB37. In any case, you should run the MAF ground to one of the sensor 'Ret' positions. You will also need to connect the MAF to switched 12 Volts (if it is not a Ford sensor, check if your sensor requires some other voltage) and ground, as appropriate. These files go in the project folder's \inc\ sub-directory. This directory might already exist, or you may have to create the directory. You must rename the file you want to load to 'maffactor.inc'. Then , in TunerStudioMS, go to 'Tools/Calibrate MAF Table' and click the 'Write to Controller' button. TunerStudio will show the progress as the table is written to the controller. You can have more than one MAF .inc file in your \inc\ sub-folder (more recent versions of TunerStudioMS have these built in as defaults with the files already in place - if they aren't in place, just copy the following files to the project folder's \inc\ sub-folder). referenceTable = mafTableBurner, "Calibrate MAF Table..."
tableIdentifier = 003, "MAF Table"
©2006, 2011 Bruce Bowling and Al Grippo and Lance Gardiner. All rights reserved. MegaSquirt® and MicroSquirt® are registered trademarks. This document is solely for the support of MegaSquirt® boards from Bowling and Grippo.